In the 2010 Oakland mayor's race, a shadowy group with an innocuous-sounding name - Coalition for a Safer California - blanketed the city with glossy mailers in support of then-candidate Don Perata. The group spent so much money on Perata's behalf that it broke the city's spending cap for the mayoral campaign, thereby allowing Perata to spend more than the cap, too. The maneuver gave Perata a huge financial advantage over his competitors and nearly allowed him to pull out a victory that year. And unless you were following the race closely at the time (and reading the Express), you wouldn't have known who was behind Coalition for a Safer California or who was bankrolling it (the California prison guard's union). Under local and state election laws, political operatives and big donors can form these types of shadowy groups and then hide behind them so that they can keep their true identities secret from the general public. A similar group has yet to emerge in this year's mayor's race, but it could. In 2012, a secretive Arizona-based outfit - Americans for Responsible Leadership - funneled $11 million into a campaign to defeat Proposition 30, a tax measure, and in support of Proposition 32, a statewide measure that sought to dramatically weaken the power of organized labor in California. A bill currently in the state legislature, however, would go a long way toward lifting the veil on some of these shadowy groups. Sponsored by the good government group California Clean Money Campaign, SB 52 would require political campaigns that spend in favor of or against a ballot measure to prominently disclose their top donors in mailers and in TV, radio, and internet ads. In the case of Americans for Responsible Leadership, SB 52 would have required that the group's ads reveal that its biggest donors were San Francisco financier Charles Schwab and the Fisher family of the Gap clothing empire, also of San Francisco (John Fisher, one of the campaign's biggest donors, also is the majority owner of the Oakland A's). We only know the identities of these donors because of an investigation by the California Fair Political Practices Commission. SB 52 has been endorsed by numerous groups and enjoys widespread support - more than 75,000 people have signed a petition urging the legislature to adopt it. "People really want to know who pays for political ads," said Trent Lange, president and executive director of the California Clean Money Campaign, "and are sick and tired of being deceived." SB 52, in fact, serves as a partial antidote to political deception and to groups like Americans for Responsible Leadership - and to decisions by the conservative US Supreme Court that have effectively allowed unlimited spending in political campaigns. But the bill has an uncertain future because it's now facing staunch opposition from an unlikely source: organized labor. Over the past few weeks, both SEIU California and the California Labor Federation have sent letters to members of the state legislature urging them to reject SB 52. Representatives from both organizations declined to comment for this report, but the letters complained that disclosing the names of big donors would be overly burdensome. Such disclosure rules "interfere with the political message of [advertisements]," wrote Mitch Seaman of the California Labor Federation. Seaman's letter was addressed to Assembly Speaker Toni Atkins and to state Senator Mark Leno of San Francisco, the primary author of SB 52. Although Republicans in Sacramento generally oppose SB 52, the only other registered opposition to the bill (besides organized labor) comes from the conservative Howard Jarvis Taxpayers Association, which tends to oppose most political reform measures. The bill has already passed the state Senate, but faces an up-or-down vote in the Assembly this week, and the opposition by organized labor is putting pressure on Democrats to vote no. "It's very disappointing to us," Lange said. It's also disappointing for the cause of transparency in politics. California has a long history of big-money political campaigns being waged by wealthy individuals, groups, and corporations that have taken advantage of the secrecy that state law allows. In 2006, another innocuous-sounding group - Californians Against Higher Taxes - spent more than $94 million to defeat Proposition 87, a proposed oil severance tax that would have funded green energy programs. The group's top donors were Chevron, Aera Energy, and Occidental Petroleum. Likewise, in 2012, a group called the Coalition Against the Costly Food Labeling Proposition successfully defeated Prop 37, the GMO-food-labeling measure, by spending more than $44 million. The group's primary donors were Monsanto, DuPont, and PepsiCo. 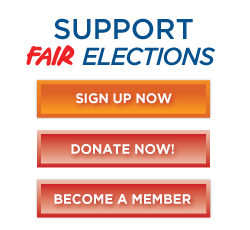 In addition to requiring more transparency in political campaigns, SB 52 also would prohibit shadowy groups from funneling donations through several campaigns so as to keep the original source of the money secret - which is what Americans for Responsible Leadership did in its efforts to weaken labor unions two years ago. As such, it's hard to understand exactly why organized labor has decided to oppose SB 52 - unless unions also believe that they benefit from political secrecy. Which is too bad, because California needs more transparency, not less. In fact, SB 52 could have been stronger; it could have required more disclosure not only from groups that support or oppose ballot measures, but also from ones that work to elect or defeat a candidate - just as the Perata-linked group did four years ago.